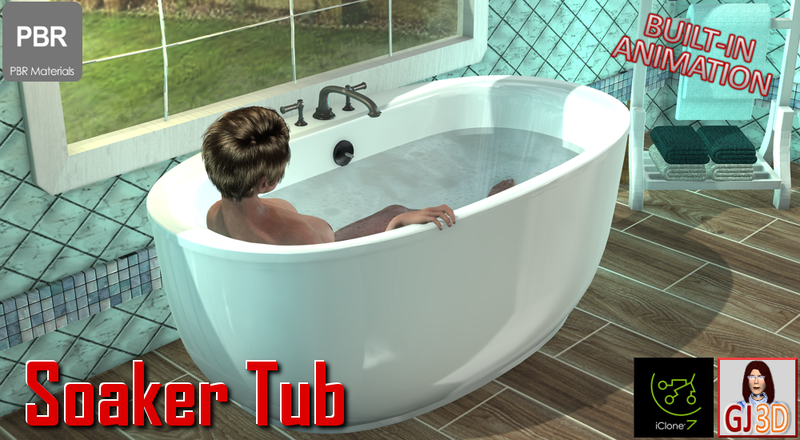 This PBR Soaker Tub has built in animation for filling the tub, soaking in the tub & draining the tub - simply edit the entries in the timeline to suit your filming needs. The pack also includes avatar motion to mimic lounging in the soaker tub. Thanks for all the great products. "Found 1 files load failed. Pleases check whether thefile exist. Or, make sure the required codec is installed in your system. I have the water templates but no J:/ drive. CyberpowerPC, 32 GB Ram, 64bit Windows 10 Pro, Intel Core i7-8700K CPU @ 3.70GHz, MSI Z370 Gaming M5 Motherboard, ROG-STRIX-RTX2080TI-O11G-GAMING graphics card, Toshiba 3TB hard drive, Seagate 2TB hard drive, Western Digital 1TB hard drive, ASUS PA329Q 32" 4K/UHD IPS Monitor. The solution is fairly simple. The bath water & the pouring faucet water use default iClone video bump maps from the default Shared Templates folder. Simply select the bath water sub prop in your scene manager - then in the texture modify panel, click on the BUMP icon and navigate to your Shared Templates directory ( the typical path is C:\Users\Public\Documents\Reallusion\Shared Templates. Then select the VIDEO folder. Then select the WATER folder. Then double click on the WaterNormal06.avi file. Once selected, in your timeline, you can drag to extend the video bump to the needed time length for your scene. In the future, to receive a quicker response, kindly send an email to grannyj@grannyjs3dattic.com - I check email daily, but only check forum pages sporadically. I did email you on 7/5/2017 but never heard from you so Iposted the same info on the forum. I alreadyknew how I could “fix” the problem but was trying to point out the installationissue.